Are you going to be a zombie for Halloween this year? Or are you a zombie every day and maybe you will make a change on October 31 and wake up. If you live in Honolulu, Hawaii, you may consider going as a giant ticket or a traveling smart phone this year because zombies are not welcome in this city anymore. We have all heard of distracted driving, but have you ever heard of distracted walking? Let’s be real. What does distracted walking really mean? It refers to people who are more engrossed in whatever it is on their smart phone than what is on the road ahead of them. As I wrote about earlier this week, we all share the roads, and we all need to respect the others around us. It is easy to picture the distracted walker. The person could be male or female, 25 years old or 65 years old. The smart phone is held tightly in one or both hands. The body is slightly slumped forward with both eyes fixed on the screen. Sometimes the fingers are typing away some inane message to a friend or colleague. The person is totally unaware of the busy street – or world – around him or her. This person bumps into other people on the sidewalk, crosses the intersection when the light is about to turn red and does not check to make sure a car is not coming. Whatever is on the screen of the phone is clearly more important than staying safe as he or she cross the road. I will admit that once in a while I become a zombie when I walk down the sidewalk. I try to avoid this behaviour unless I need to contact someone urgently, but yes, sometimes I am guilty. Admit it – you are guilty too. We are becoming a society of zombies. You don’t need to waste money dropping $15 at a movie theatre anymore to see the latest zombie flick. Just head downtown and watch the zombies cross the street. But do we need laws that actually ban people from checking their smart phones while they cross the street? I would say no. As we embrace technology and change our lives each day to include it, we must adjust our behaviour and be responsible. It’s great that I can text my family who live in New Zealand while I am in downtown Toronto. I love that I can check the score in the baseball game no matter where I’m walking. And it thrills my mother that she can call her three children no matter where we are. But I can send that text when I sit down at the local coffee shop. While I am a big sports fan, I don’t have to know the score in the game while I’m walking along the sidewalk. I can speak to my mother on the phone later. What I – or anyone around me is doing on the smart phone really is not urgent. Whatever it is I or those around me are doing really can wait. Let’s face it, distracted walking is dangerous. It’s dangerous to the distracted person and to everyone – the pedestrians, drivers and cyclists – on the street as well. It even seems to be dangerous to “motionless objects such as street signs, doors or walls,” according to a warning in the United States from the National Safety Council (I have never walked into a street sign, door or wall while using my smart phone. Have you?!). Be smart when you use your smart phone. When you are walking to your car, running for the bus or crossing the street to get a coffee, drop your phone in your purse or pocket for a few minutes. Don’t be accused of distracted walking, especially if you live in (or are visiting) Honolulu. Part 3, that’s right. I really want to think the best of Toronto drivers, but my anger on the roads lately has been bubbling. 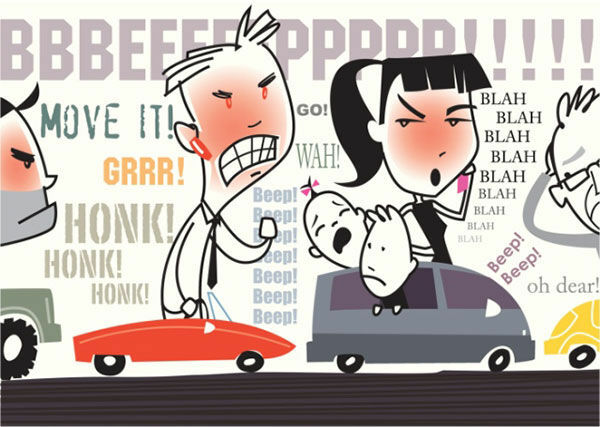 Every day, when I drive around the city, I encounter a combination of aggression, rudeness and utter stupidity. I had to write another post about it. Today’s theme is: share the road. What do I mean by share the road in the context of this post? Every time you leave your house you travel to a destination. You may drive, walk, take public transit or cycle. At some point on your journey you are on the road, and you share it with other people in your community. I am asking everyone – drivers, pedestrians and cyclists – to really think about the word share and how we can really embrace what it means. I am driving down a busy road and approach an intersection with a green light ahead. There are no cars behind my car. If you are approaching that same intersection from the opposite direction and wish to turn left, please wait to make your turn until I am through the intersection. Why do you have to play chicken and beat me, forcing me to slam on my brakes? Or if you wish to turn right at that intersection, when you have the red light and want to go in the same direction as my car – also, please wait your turn. Okay, maybe this is an aggressive side of me. I learned, years ago, in driving school, that a driver is supposed to gently inch into the middle of the intersection when going left at a traffic light. If you are that car in front of me at a green light, waiting to go left, it’s okay to move into the intersection while you wait your chance to turn. It means I too can go left after you. If I have to miss yet another light as I wait for you to turn left I start to become angry. Here is another example. If I am driving down a busy two-lane street and I put on my signal, which clearly shows my intent to change lanes, why do you need to accelerate your vehicle just enough to ensure that I can’t do just that? 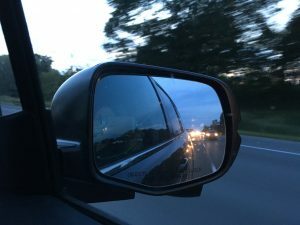 If you slowed down a little or even just kept your same speed – and showed some courtesy – and shared the road – I would be able to change lanes. Try it some time. You will feel better. When I talk about the importance to share the road, it’s not just about drivers sharing with other drivers. There are so many combinations of people out on the roads that I believe we should equally show courtesy to each other. One combination that is forever butting heads: drivers and cyclists. I could write pages about this conflicting pair. I am usually a driver, but I also believe strongly in cycling. My husband usually cycles to work on busy downtown streets, and on his way to work he often cycles with my children to school. I am a strong advocate of cycling. However, I also believe that cyclists must be responsible, follow the rules of the road and share that road with drivers. Stop at a stop sign. Go the right way down a one-way street. Wear a helmet to be safe! Drivers: when you make a right turn at a busy intersection, check first to see if a cyclist is there. Give space to a cyclist on a busy street. When you park, and open your car door, check first that the way is clear so that you don’t open your door on an oncoming cyclist. 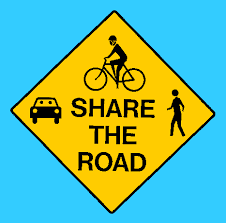 Drivers and cyclists: share the road. Pedestrians, I haven’t forgotten about you. You need to wake up too. You need to know that while you have the right of way on the road (drivers, remember that! ), you don’t own the road. Don’t cross at a red light. 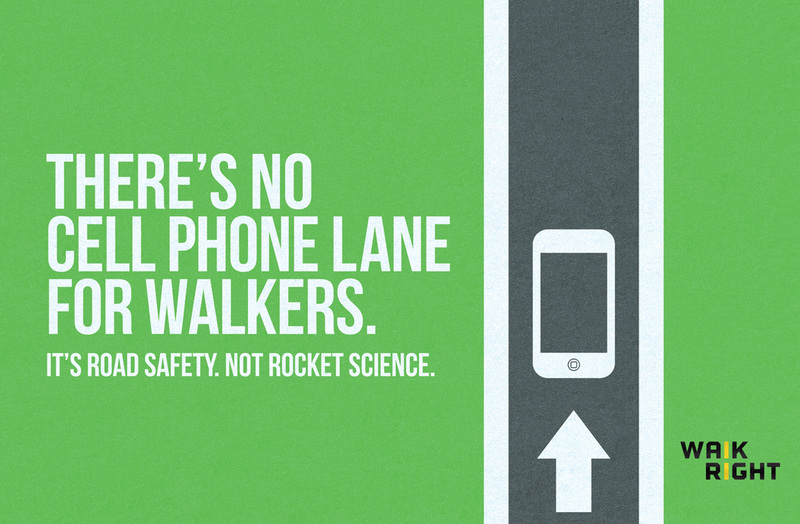 Look up from your smartphone when you cross the road. If the countdown clock flashes 3 seconds, it’s too late to start to cross the road. And drivers, remember that a pedestrian is a human being. If you hit that human being you could injure or even kill. Check for pedestrians when you turn right – or left – on any intersection. Please, loyal readers, keep all this in mind the next time you leave your house and hop on the road – with your car, your bicycle or your feet. Keep words in your mind like courtesy, civility and gentility. And remember, share the road. Are we a Defiant Society? 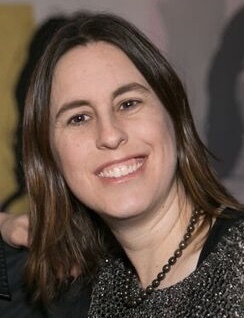 Recently I attended an event, where I volunteered as an usher and general support for the organizer. As the keynote speaker was about to begin his speech I was asked to help corral participants (about 150 people) to the designated seating area to hear and watch the presentation. It was a mid-morning event, and people had coffee cups and snacks in their hands. Most of them happily listened and took a seat in the designated area. But a few people were defiant and refused to listen. No matter how many times they were asked, in many different polite but firm ways, they stood, or sat, where they wanted. I’m all for standing up for yourself, being a strong person and holding your ground. In the right situation. I hope that I am raising my children to be confident, strong people. But, that’s not the same as defiant. When I look up “defiant” in my word processor’s thesaurus, I’m intrigued that its suggested words are everything from insolent and insubordinate to bold and cheeky. Interesting. Actually, I’m laughing. 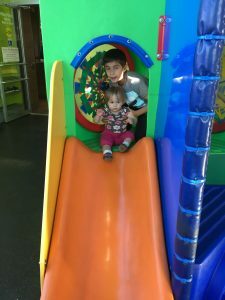 My middle child, Julia, is most definitely a cheeky little girl, and her personality can definitely be defined as bold. But for me, that’s not the same as defiant. Insolent and insubordinate are definitely the terms I would use to describe the people who defied my requests to sit with the rest of the group at the event. These people were just plain rude and they stood out from the crowd in a negative way. And I don’t believe their behaviour is unique in our society anymore. I see defiant behaviour every day when I drive around the city. The person who jumps the stop sign and rolls through when it’s my turn to go or the aggressive driver who pushes into a turning lane last minute so as to avoid the long line to get on the highway. How about the cyclist that flies through a red light or rides the wrong way on a one-way street? Defiant? I think so. Maybe this behaviour is situational. For example, have you noticed how defiant people can be at the airport? When you travel, how many times are you forced to line up? If you check a bag, line up at the desk to hand it over. Then line up for security. There’s always a line-up to get food or drink, and my gosh, what a process to line up to get on the plane. People try to cut in and cut you off all over the airport, every step of the way. The person who pushes in line ahead of me to get on the plane first – is that person defiant or has he or she just had enough of the stresses of travel? 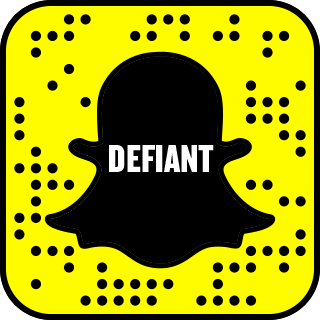 Based on my many experiences traveling, I would say, defiant. Maybe I’m just a crank and have become too touchy as I get older. Maybe I am easily bothered by what I see as purely impertinent behaviour. I feel it’s important to show consideration for those around you – whether it’s a driver in the other lane, the traveler ahead of you in line at security or the person who asks you to take your seat with the group. Be bold and cheeky when the situation calls for it. Be respectful and compliant when it doesn’t. Over the Labour Day weekend my family spent a wonderful few days at my uncle’s cottage in Minden Hills in Ontario. But this post is not about enjoying a cottage or Labour Day weekend. 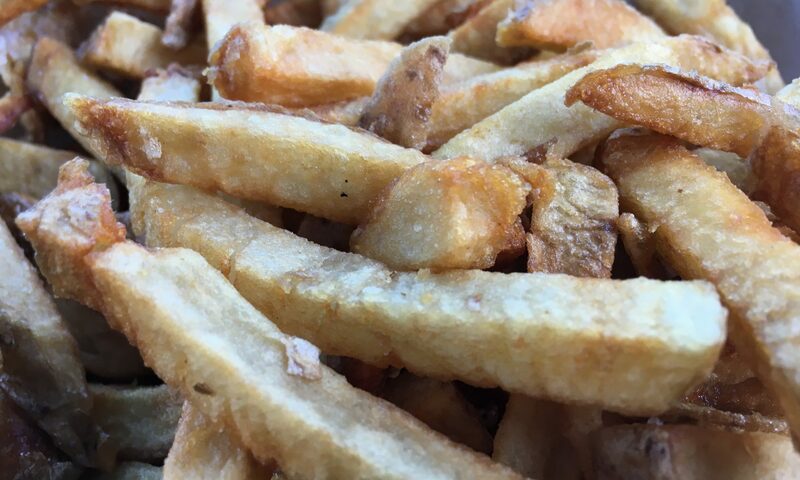 This post is about French Fries. 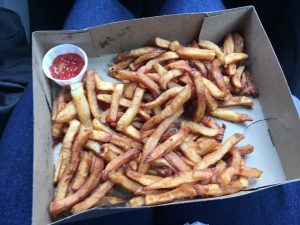 What does a visit to a cottage in the countryside have to do with French Fries, you wonder? Everything, I say. You see, I love French Fries. I don’t just love any variety. They have to come from good potatoes and must be cooked with care. Let me explain. If I had my way, a well-balanced meal would be French Fries and ice cream, my two loves. My ice cream post will come another day, as today is all about the fried potato. People around the world love to fry and eat potatoes. I believe both the Belgians and the French claim to have invented this delicacy, which has roots all the way back to the 17th century. Fries, frites, chips, whatever you want to call them, I am not the only person to love this fried goodness. The best way, in my opinion, to eat French Fries, is from a truck or stand that lives on the side of a road or highway. Chip wagon. Shack. Fry stand. Whatever you want to call it, this is where to find the best eats. I am not a fan of the places that make a variety of foods and claim to have great fries but, in reality, have bags of pre-cut potatoes in a vast freezer in the back. I don’t care how much oil you use to fry them up, those are not French Fries. 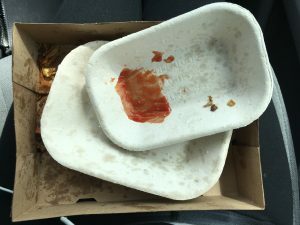 My first favourite fry shack on the side of the road belonged to “Fry Guy.” To this day, I don’t know his name, but wow did he make them well. He built a small shed beside a gas station on the way up to our family’s country house, and it was hard for us to pass that place without stopping for a snack. 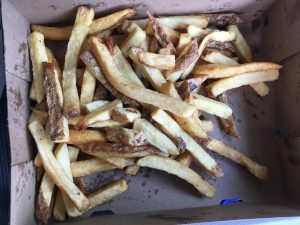 Fry Guy was a retired history teacher who had a knack for making great fries and great conversation. His shack wasn’t so clean and he was eventually shut down. Maybe it was the dirt that made his food taste so good? Fry Guy was replaced by Fry Girls, and up the road we also discovered Fry People. And I have tried so many more, most of whom were not honoured by a special name from me. So, what makes a roadside French Fry just so tasty and enticing to the palette? First of all, as I mentioned above, it has to start with a good potato. Then the potato must be hand cut, with the skin left on. It has to be fried in very hot oil, to make it soft in the inside and crispy on the outside. A bit of salt to finish it off is key. I believe all good fry stands follow this basic formula, and of course they all make it theirs in their own way. For example, in Quebec, I enjoy frites, which are much thinner and stringier. I find them, for the most part, much greasier, but that’s okay. Also, in Quebec, frites are typically served in a paper bag. 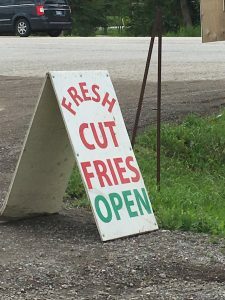 My favourite frites stand is on highway 329, deep in the Laurentians, between the towns of Ste Agathe and Saint Donat. Yum. Yes, I enjoyed my fill a couple of weeks ago while we visited the area. 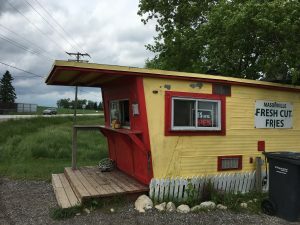 I found a fry stand this past weekend on the way to my uncle’s cottage that I simply adored. 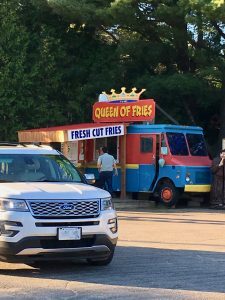 The Queen of Fries Chip Truck is located in the village of Norland, and I give them permission to include the word “Queen” in their name. The potatoes they use are local, they are hand cut, with skin on, and their oil was super-hot to produce a perfectly cooked fry. We devoured the family size. No matter how many French Fries I eat I can never get my fill. Which is why I am on a quest to find the best French Fries. Maybe I need to go on a road trip across Canada, or North America, or do I have to jump over to Europe? I could travel for days, weeks or maybe even months, testing out the best there is from Vancouver Island to Eastern Newfoundland, from Northern Ontario down into Texas. Or maybe a hop over to the back roads in England, over the Channel and through French and Belgian villages? Tell me where your favourite French Fries, frites or chips place is, no matter where you live. I hope to visit them all. Post me a note on Facebook, leave a comment here, or Tweet me @AliciaRichler. This is going to be fun! Driving around the city makes me cringe. While aggressive and rude drivers often make me crazy, today I am focused on the actual road. I am talking about construction, blocked lanes, potholes and turn signals. If I live in a city I know I have to face some of this, especially in the summer, but the streets around my neighbourhood are a mess and I can’t take it anymore. Toronto is a vibrant city that is growing exponentially by the day. To accommodate that growth, I know that new houses, office towers and condos must be built. The dense and congested midtown and downtown core are experiencing unprecedented development, and I think that for the most part that is good for the city. The roads also need to be maintained and the hydro needs to be upgraded. I get it. It has to be done. However, there has to be a better way. I am about to provide a number of examples where construction, development or upgrades are happening in my neighbourhood that could be done better, more efficiently or at least with better communication with the local community. There is a massive condo tower under construction at the intersection of two major streets near my house. Construction is moving along, but it’s happening at a painful slow speed. In order to maximize the small tract of land on which this building is being built, the developer obviously got a permit from the city to build the new building as close to the existing sidewalk as possible. As a result, the construction crew got permission to include the sidewalk in its enclosed area and to push out the pedestrian zone into a lane of traffic. That means a major street in the city of Toronto was brought down to one lane during the construction of this massive building. The street has been down to one lane for a long time, with no end in sight. Traffic is backed up for blocks all day every day along this stretch of road. I figure the developer had to pay a large fee to the city to get permission to close a lane of traffic, with no regard to the congestion, stress and frustration it causes thousands of people driving daily. How is this allowed? I just got word another developer is looking to apply for a permit to build three condo towers in the area next. There is no way my neighbours and I will allow this. But that is for another day. On the subject of closing a lane of traffic on major roads. I understand that it must happen sometimes, in particular when city crews need to fix a pothole, some electrical nearby or other issues that affect city roads. Naturally this causes traffic jams and I understand those lanes must close sometimes. But – if it’s a major street and if the lane closure is at an intersection, could the city block left-hand turns during construction? When there is one lane of traffic and one person wants to turn left then every car behind is stuck. It makes the traffic worse. Driving in the city today I sat in a terrible traffic jam downtown today because of this problem. Now that I mention left-hand turns, let’s stick with that topic. Why can’t there be more left turn advance signals at major intersections across Toronto? I would be happy to wait an extra 10 seconds at most lights to give cars the opportunity to turn left and clear the road. There are many intersections in the city where the advance arrow exists but only goes on at certain times of the day. Why not all day? Back to construction. When our current mayor (who I like and I will publicly state I voted for in the last election) was first elected a few years ago he spoke out in support of better coordination and communication between city departments with respect to road construction. If a long-term construction project must take place, be it hydro upgrades, paving, bridge repair or dozens of other projects, how hard could it be to have a working group with a giant map who monitors where the project is happening? I am boxed in by construction in my neighbourhood right now, between the endless lane closure from the condo on the major street to my west, a massive bridge upgrade on the major street to my east, hydro and electrical upgrades to the side streets to my south and what I think is an electrical and power upgrade to some facility to my southeast. That is just a small section of the city – I won’t start with all the other projects happening during summer 2017. I know my rant is falling on deaf ears with the City of Toronto, but I have a feeling that most of you who have read to the end of this blog post agree with me. You are probably nodding your head right now and saying yes yes yes – even if you live in a different city! My rant may not make a difference, but I do feel better just writing about it. Sometimes I am an angry driver and I believe that it’s not always my fault. A couple of weeks ago I examined a number of reasons why so many city drivers are aggressive and full of rage as soon as they jump behind the wheel of their car. Today I am going to look at a few more, and these, for the most part are the cause of much of my stress as a driver in the city. This is an issue that angers not only me but also his Worship John Tory, the Mayor of Toronto. Traffic is slowed or sometimes comes to a standstill if just one vehicle is stopped on the side of a major city street, in particular at rush hour. It means all cars in that lane need to push their way into the other lane. Often when I am faced with this situation, when the car ahead of me suddenly puts the four-way flashers on and stops in a no-stopping zone, I need to change lanes and hope that the car in the lane next to mine is polite enough to let me in. Usually the person is not so kind. Delivering parcels or furniture to homes on small cramped city streets is a challenging job. I don’t doubt that driving around the city in a large vehicle and trying to find somewhere to park that vehicle can be tremendously stressful. However, I am also quite sure that these delivery drivers do not need to turn polite easygoing car drivers into crazy people as we attempt to squeeze past the giant trucks on side streets. If there is parking on only one side of a one-way street, for example, why does the delivery truck have to park on the other side and block the road? My passenger side mirror was once lopped off by one of these said trucks, who easily could have parked on the other side of the street where there were a ton of empty spots. Don’t block the road! Most downtown two-way streets are designed with space for two cars across. That means that cars can drive down the street in both directions, with space for each to drive. If cars are parked (legally parked cars I mean!) on one side of the street it means there is now only space for one car to drive down the street. If the cars are parked on the opposite side of the street than the side I am driving on I believe that I have the right of way. The cars driving in my opposite direction are supposed to wait while I drive by then they are supposed to go around the parked cars once I am out of the way. So why is it that many cars not only don’t wait but I can sense their aggression as they accelerate when they see me and intentionally don’t let me pass – or make me jump onto the curb so I don’t hit them? Wait your turn! I would consider myself to be a law-abiding driver. I stay within a few kilometres of the speed limit, I stop at stop signs and I follow turning signals. When I see a sign at traffic light that states “no left turn between 4-6 pm” and it’s 4:09 pm, I don’t turn left at that light. It’s very simple. I will give a pass to the odd driver who doesn’t notice the sign, signals, waits then realizes and does not turn. I will be angry, however, with the driver who sees the sign, signals, hears the honking horns and sees the line-up behind and turns anyway. These rules are there to help keep traffic flowing even if it is an inconvenience to most of us. Just please follow the signs. This one is a bit more complicated but can turn me into an angry driver. Sometimes you are in traffic on a busy street and you can see for blocks ahead that you are going to inch your way forward. Every time you move is exciting and you jump at each opportunity to gain even a foot or two of the road. You approach a side street off to your right and you know that traffic is so slow that you can’t clear this minor intersection. You move ahead those few feet anyway and block the road. Now I am driving along in the opposite direction and need to turn into said side street. You just can’t bear to wait to move forward those next few inches, so you block me from making my turn. Why can’t you keep the access to the side street clear? Does it slow you down that much to let me through? Now you are still stuck in traffic and I am an angry driver. Please keep sending me your thoughts, comments and suggestions for what turns you into an angry driver or ways we can all make the roads a less stressful place to drive. And as I had mentioned, coming up soon I will also look at the relationship between cyclists, pedestrians and drivers on our busy roads. Please post your comments here or Tweet me @AliciaRichler. I remember a cartoon many years ago, or maybe it was a story or video, about a gentle, sweet, kind person who smiles at strangers when she walks down the street or he helps an elderly woman cross the road. He (or she) is the kind of person we all strive to be. But when she (or he) opens the car door and gets behind the wheel aggression and rage take over. Sweet Sadie or Gentle George become Angry Annie or Raging Robert. This isn’t the cartoon or video I remember but it’s funny! Maybe living in a congested city has forced so many people to keep their guard up and become aggressive when they get behind the wheel of a car. I have noticed that when I leave the city and drive even one or two hours into the countryside people are friendly and considerate. So maybe it’s a symptom of busy city life, but here, at Kinetic Motions, I am going to try to start a revolution and suggest some ways we calm Angry Annie and Raging Robert down. 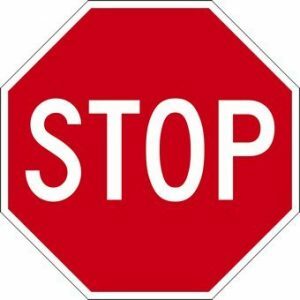 These are large, red, hexagonal signs that are very clear in their message – STOP! When you approach one of these signs your vehicle needs to come to a halt. And if you arrive at a four-way stop sign, and my car arrives there first, be courteous and let me go ahead. Remember that we all learned in kindergarten to take turns? If I can see the colour of your eyes in my rear-view mirror it means you are driving too close to my car. If my car needs to stop suddenly, for whatever reason, I need to know that your car is sufficiently behind mine to give you the time, say two or three seconds, to stop, and not hit my car. This, in my mind, pertains to highways, busy roads and even side streets. 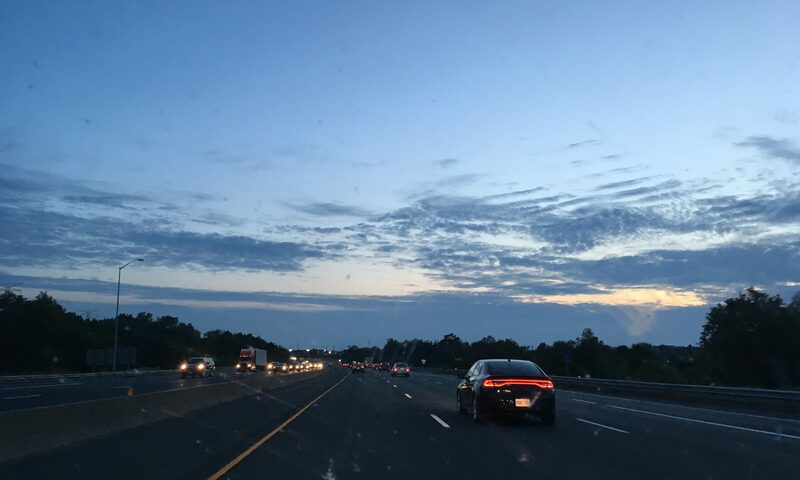 I recognize the distance between cars should be greater on fast-moving highways, but I still believe that no matter what roadway we are on you need to keep your distance. Everyone seems to be in a rush as soon as they get behind the wheel of their car. The baby needed a diaper change right before you had to leave, you forgot your cell phone in the house and had to go back to retrieve it or your neighbour, who you do normally love chatting with, had a question for you as you unlocked your car door. Now you are late. And there is traffic. You try to drive just a bit faster on some roads to make it to work, an appointment or a lunch date on time. You cut off cars, you tailgate others and naturally you jump stop signs. SLOW DOWN! It may be annoying for you that the City of Toronto lowered the speed limit on many residential streets from 40 to 30 km/h and that many thoroughfares also now have lower speed limits, but I support the slower speeds. We are safer if we just drive a little slower. If traffic is moving very slowly, you are inching along the road and approaching a traffic light, please stop BEFORE you cross the intersection if your car can’t make it through. If you get stuck in the middle of the intersection when the light goes red it means the cars in the other direction can’t move, and traffic just gets worse. You may actually create a traffic jam when you grid lock. I understand the feeling of accomplishment when you just make it through a light in heavy traffic, that little adrenaline rush when you moved those extra few inches, but if you think you may get stuck in the middle of the intersection, next time, please, just wait. I have a one-year-old and live in a neighourhood with a high walk score. We are surrounded by both parks and retail and restaurants. I walk everywhere with the baby in the stroller and always have to keep my eyes peeled on the road, ready for a car to turn in front of me or jump a stop sign. Pedestrians have the right of way at intersections (assuming the person is crossing at a green light of course), but many drivers don’t notice or don’t care. The baby and I were almost rammed last week by a woman driving a large SUV, turning left, with her cell phone in her ear. She looked up and apologized when I started to yell. This one is simple: wake up and give pedestrians the right of way. Why do you need to honk your horn if I’m not going fast enough (in your opinion), if I actually stopped at the stop sign ahead of you or if I take my time to turn right at a red light? If I am ahead of your car, waiting to turn and I can see there are cars coming and you can’t because you are behind me, don’t honk me! When the intersection is clear of cars I will go and I won’t be rushed. If the lead car in a long line of cars waiting to turn left at a traffic light is just sitting there doddling when the signal turns green okay give a light honk. But you don’t have to lean down hard on the horn nor do you have to honk that car before the light even turns green. I am sure there are many other ways to calm down Angry Annie or Raging Robert and I welcome your suggestions so that I can create an ongoing series of posts on this topic. Coming soon will also be my thoughts on the relationship between cyclists, pedestrians and drivers on our busy roads and ways for everyone to be more courteous. Please post comments and suggestions here, or Tweet me @AliciaRichler.